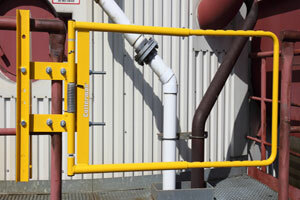 Unprotected openings can be found scattered throughout most plants and facilities. Stairs, platforms, mezzanines and catwalks – not to mention machinery – can all be lurking dangers if not properly protected from employee traffic. 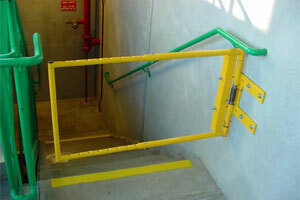 An A-Mezz safety swing gate may seem like a simple thing. But these self-closing traffic controllers increase safety and are strong enough to handle your busiest day. 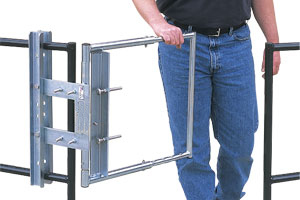 Adjustable - Our gates have 2" adjustment increments and can extend for extra wide openings. Self-closing - Stainless steel springs close the gate automatically, unlike chains. Versatile - Fits square rail, round rail, angled rail - even a flat wall. The same gate can be installed for left or right hands. Easy to Install - Takes just one ½" wrench and 5 minutes. Comes fully assembled with U bolts for quick installation. 29 CFR 1910.23 Guarding of floor and wall openings and holes.